Bilbao Spain Titles – Bilbao boasts the category of historic town, with the titles of “Very Noble and Very Loyal and Invicta”. It was the Catholic Monarchs who awarded the title “Noble Town” on 20 September of 1475, according to the customs of the time, while Philip III of Spain, by letter dated 1603, gave the title Villa to the dictates and title of “Very Noble and Loyal. ” After the episode of the siege of Bilbao during the Carlist War, on the 25 December of 1836, the title of “Invicta” was added. The titles, the flag and the emblem of Bilbao are traditional symbols and are part of its heritage, being employed in the image of other cities, formal events, for identification and decoration of specific places or for the validation of documents. Bracknell Forest Berkshire – Bracknell Forest is a unitary authority and borough in the county of Berkshire in England. It includes in addition to the garden city of Bracknell with its administrative centre and the surrounding villages of Binfield, Crowthorne, Sandhurst, Warfield and Winkfield. The authority was established on 1 April 1974 as the District of Bracknell. In May 1988 it received the status of a Borough, and the name was changed to Bracknell Forest. Bracknell was formerly twinned with Opladen in Germany it is now twinned with Leverkusen. Surrounding Berkshire towns include Crowthorne, Wokingham, Binfield and Ascot. Kendal Cumbria – Kendal is an old town and civil parish in the area of Westmorland, in the southern county of Cumbria, in England. It stands on the banks of the River Kent which partly takes its name (Dale Kent means Kent river valley). Concerning the name, others say it has a Celtic source whose meaning would be “bright valley.” Today, Kendal is concerned mainly as a centre of tourism and as the hometown of Kendal mint cake (mint cake). The buildings in Kendal are constructed mostly from the gray limestone of the region, have given the nickname “the Auld Grey Town”. With a population of 27,521 inhabitants in 2001, Kendal was voted the best place to live in England after an eight-year long study undertaken by the University of Strathclyde. Portinscale Lake District Cumbria – A farming village located near to Keswick in Cumbria, Portinscale in the northern region of the Lake District between Bassenthwaite Lake and Derwentwater. Portinscale has a long history and was settled way back in prehistoric times. The area is popular with hikers and water sports enthusiasts with windsurfing and sailing top of the agenda for many visitors. The village has the basic facilities with pub, tearoom and village shop. Keswick can be reached on foot from Portinscale, most pleasantly via the footpath which crosses the River Greta. A pretty Cumbria village, Portinscale should certainly be on your list of places to visit or stay in the Lake District. Daya Nueva Alicante: Daya Nueva (in Valencian Daia Nova) is a municipality and town of Valencia, Spain. Located in the province of Alicante and the region of the Vega Baja del Segura (Low Fertile Valley of the River Segura), in the area to the left of the Segura River, east of Almoradi. The main economic activity of Daya Nueva has always been irrigated agriculture, producing citrus fruits, artichokes and potatoes. Currently the town has many shops and other businesses, and is gradually moving towards a more modern economy. Daya Nueva experiences a typical Mediterranean climate with sunny weather all year round. Daya Nueva has a population of 1,988 nearby town and villages include Daya Vieja, San Fulgencio, Almoradi, Dolores and Catral. Pineda de Mar Early History – Though today a modern tourist resort Pineda de Mar on the Costa Maresme has a long history which started even before the Romans arrived in Spain. Several remains of the Iberian period (fourth century BC) found in different parts of the town of Pineda de Mar (Montpalau Hill and near Mas Castellar) testify to the settlement in the area since time immemorial. The Iberian settlements are quite numerous throughout the Costa Maresme, the towns of the Laietans tribe, whose territory occupied the entire coastal strip from the Llobregat to Tordera stood in small promontories far from the coast. The intense process of Romanization of the region from the first century BC led to the gradual occupation of the coastal zone around Pineda de Mar, with numerous villas built along the coast, making the most of easy access by way of the Via Augusta, which led to Barcelona. In Pineda de Mar there are remains of an important Roman villa, Can Roig, where an aqueduct of four arches which are still quite visible near to Cua Can. Ipswich Suffolk – Ipswich is a city of 128,000 inhabitants. Ipswich is the administrative capital of the region of Suffolk in England, United Kingdom. The city is located in the east of the country a hundred miles from London. The centre of Ipswich provides a wide choice of boutiques, shops, bars and restaurants. The town offers a vibrant mix of heritage. The city has preserved traces of ancient origin: 650 houses and 12 medieval churches are classified. The beautiful parks of Ipswich are an important part of the legacies of the city and very popular when the weather is fine. Residents and visitors can access over 500 hectares of green space. Its location on the estuary of the River Orwell, about fifteen miles from the Port of Felixstowe gives it a dual purpose of river port and sailing centre. The city has a very diversified economy. The Orwell River that flows through the city is a real asset for aesthetics and tourism. Ipswich is a student town. Near the town are the coasts of Suffolk, impressive heritage of the region and the natural beauty of the forests of Thetford and Rendlesham. The nearest towns are Felixstowe, in the same area of Suffolk, and Harwich and Colchester in Essex. Marlow Buckinghamshire England – Marlow (14,000 inhabitants, previously Great Marlow or Chipping Marlow ) is a small British town situated on the banks of the River Thames. Marlow lies on the River Thames next to the A 404, which intersects the north-east of the town with the A 4155. The town of High Wycombe is to the north, Maidenhead about 6 miles to the south, Reading is located 15 km to the southwest and to Heathrow airport in the southeast it is about 20 km. The town of Marlow is known for one of the oldest suspension bridges in Europe, designed by William Tierney Clark, it was built between 1829 and 1832. Marlow is a popular place for a walk along the River Thames, especially when the weather is fine. Also worth seeing is the church of All Saints. Marlow is a driving distance of about 5 miles from High Wycombe in the county of Buckinghamshire. Valencia Fallas 2012 – On Monday we took a coach trip to see the final evening of the Fallas celebrations in Valencia. We picked up in various places along the way ending in Gran Alacant which was the final pick-up. We then headed along the Costa Blanca coast passing the airport and going up the A31 past many of the old historic towns with castles such as Novelda, Sax, Petrer and Villena, then cutting through to the Font de la Figuera (Spring of the Fig Picker), and picking up the A35 past Moixent, Montesa, L’Alcudia de Crispins and Xativa before reaching Valencia, for us a journey of 4 hours (we got on at Cabo Roig). While there are many different celebrations in the Fallas, the star of the show is the building of giant effigies which are burnt on the final night together with a massive firework display. 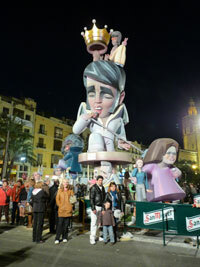 Some of the effigies are huge (up to 20 metres high) and make fun of famous people mostly Spanish, though one of the best this year featured Elvis Presley with a number of other famous pop stars such as Jimi Hendrix, John Lennon, Freddie Mercury etc. I must say the giants are amazing an it seems a shame to burn them though they do hand out some smaller sections of the figures to local children. There was some concern over the weather on the day as rain was expected and in the event the celebrations went on in fine weather (though a bit chilly) and it actually started to rain as we got back on the coach for the journey home (and on through the night, some 6 inches of rain in all!). We really enjoyed the whole event and the burnings are amazing, if rather smelly and dangerous, with burning pices of polystyrene flying everywhere, the fireworks were excellent, the display of flowers was amazing. Abingdon Oxfordshire – Located just to the south of Oxford on the River Thames , is a town in Oxfordshire called Abingdon with a population of about 36,000. Abingdon only joined the county of Oxfordshire in 1974: it was formerly part of Berkshire . Abington grew around an abbey founded in the seventh century, and it has long been an important town, but was somewhat marginalized during the nineteenth century, especially in favour of Reading better served by the railway system. The town now enjoys the vitality of the Oxfordshire area and is home to several new technology companies. Abingdon is about 9 miles from the city of Oxford. York National Railway Museum – The National Railway Museum (NRM), is a railroad museum located in York, in the county of Yorkshire. The museum opened in 1975, bringing together in one place various collections of preserved rolling stock from the nineteenth century. The museum houses an extensive collection of over a hundred locomotives and other railway equipment. The machines are too numerous for the available space, the selection presented is frequently renewed. The most famous locomotive is the Mallard which reached the speed of 203 kilometres per hour on 3rd July 1938, a world record for a steam locomotive. The museum attracts 800,000 visitors a year and is one of the top attractions for both York and Yorkshire as a county. Woolacombe Devon – Lying in the North Devon Coast Area of Outstanding Natural Beauty, the small coastal town of Woolacombe is an ideal spot to enjoy this beautiful area, well known for its spectacular cliff formations and rugged landscape. Looking across to Lundy Island, Woolacombe is also popular with surfers, benefitting from perfect conditions for this extreme sport. Rare plant life can be found in the unique sand dunes which lie behind the main beach areas, and the National Trust who care for this area do a great job in maintaining it in good condition for all to enjoy. Woolacombe is close to Barnstaple and Ilfracombe in North Devon.